Most of the Communication Design faculty traveled to Lead Grafitti in Newark, Delaware for a one-day letterpress workshop during winter break. We were joined by printmaker Evan Summer of the Fine Arts Dept. Lead Grafitti is a family-run studio that does fine printing (wedding invitations, for example), but also offers hands-on workshops. 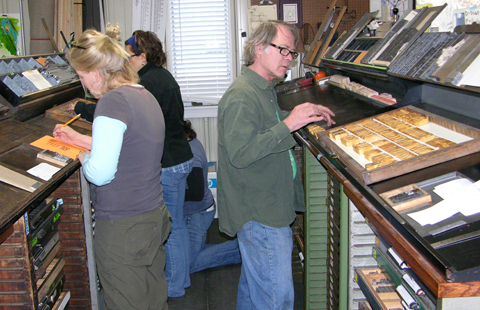 Our workshop involved creating a bound hardcover book in a single day and printing it on their antique presses. 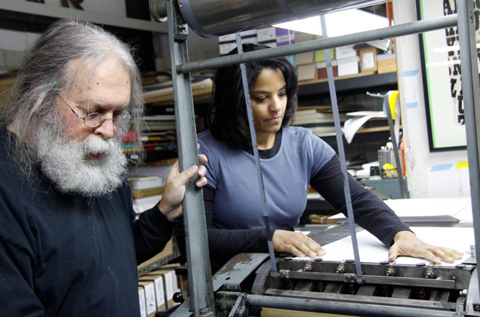 Ray Nichols is a former University of Delaware professor, reincarnated as a letterpress guru. Ray taught visual communications for years before he led a UD summer course to England. 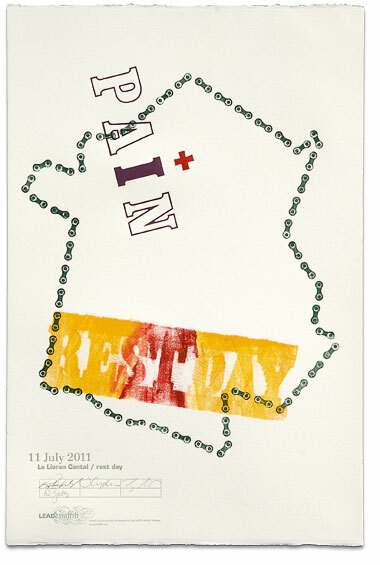 A chance visit to Alan Kitching at the Royal College of Art’s letterpress studio changed Ray’s life and he decided to build Lead Grafitti. Ray and his wife Jill shared a number of fascinating projects including their Kickstarter funded series based on the Tour de France. Inked bike chain becomes map of France, from Tour de Lead Graffiti. They also showed us a beautiful limited edition book of Bruce Hornsby’s essay on Bruce Sprinsteen’s Thunder Road illustrated by Jill. In the history of graphic design we talk about Ottmar Mergenthaler’s earthshaking 1884 invention, the linotype machine. 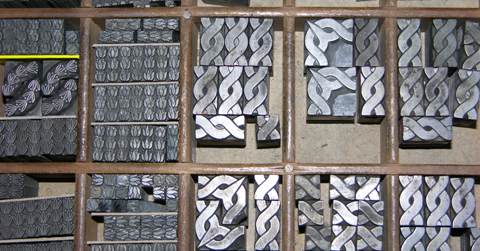 From Gutenberg’s time until the linotype, printers needed thousands of individual pieces of moveable type to print a page. 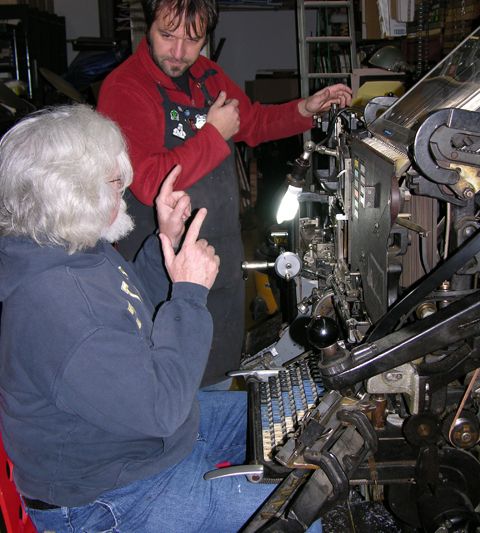 The linotype allowed an operator to type a line, then hot molten lead flowed into a brass matrix to create an entire “line o’ type.” We all got to work on an Intertype linecaster for a few minutes, which is essentially the same as Mergenthaler’s machine. 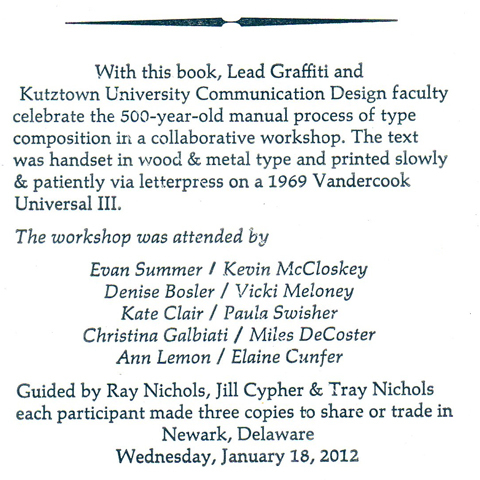 Those of you who studied typography or graphic design will recall a colophon is, “the statement at the end of a book giving details about its authorship and printing.” The colophon below was cast from hot lead and lists participants and instructors at the Lead Grafitti workshop. 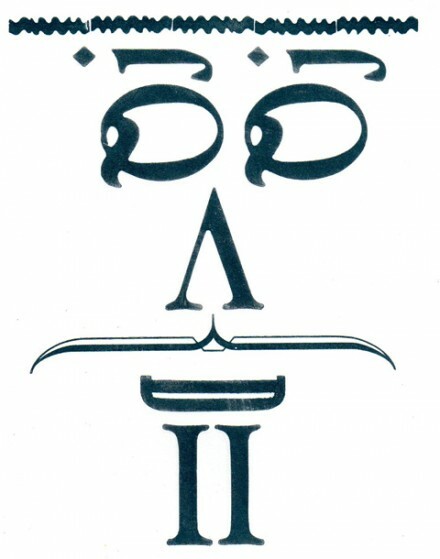 Colophon, the printing credits, at the end of our book. Wow Kevin we never really get old as long as we keep constant our quest for knowledge watching you live by this example is one thing I always admired about you .